Landscaping with Travertine: Why should I use Travertine vs. other paving materials? 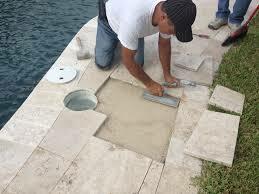 Travertine is one of the best materials to use when creating a pool deck, patio, driveway or walkway. Travertine has huge advantages over other materials often used in these areas including but not limited to increasing home value. Travertine naturally withstands the elements, including freezing, thawing and heavy rain. Their tumbled, porous surface instantly absorbs water, leaving the surface of the deck practically non-slip. Travertine Pavers also stay cool to the touch. The same can’t be said about other paving materials such as concrete pavers, or other natural paving stones. Travertine comes in many sizes allowing varying designs. A standard “packaged” pattern is a French Pattern which gives a great classic look but with other standard sizes like 6×12, numerous patterns can be configured. Travertine pavers also come in two finishes: Tumbled, most often used on pools and decks, and Brushed & Chisled for driveways, decks and other areas. Thicker slabs can be cut and finished with a bullnose edge for stair treads, pool coping and sitting wall caps. The possibilities with travertine are endless. For more Travertine information please email KW Landscaping or visit http://travertine-market.com/faq for more information. Landscaping with Travertine: What is Travertine? For more Travertine information please check out: http://www.what-is-travertine.com or email KW Landscaping to learn how you may use Travertine in your next Maryland Landscaping project.